At the Narrow Passage by Richard Meredith, Sci Fi. Book is in good condition, all pages intact. A warning of pending doom is sent back from the future, but the message is not intended for us. Rather, it was sent to the reptillian Krith who inhabit Earth in a parallel timeline. A bloody struggle for control of the future erupts across the timelines. 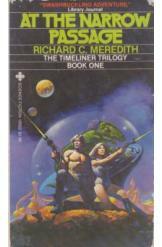 Book 1 of the Timeliner series.